From the beginning, it was a smooth transition. “dynaMACS offered the best features minus the headaches. dynaMACS aligned perfectly with how we wanted to track sales and commissions,” Ortega says. Because Mizzen Marketing can see trends, the agency is able to be proactive. “It’s insightful on so many levels,” Ortega says. “Everything we need is right at our fingertips.” Even the sales reps in the field have easy access and can pull up data on their laptops before going into a sales meeting. Restore points in dynaMACS are important when performing some functions such as posting sessions or doing transfers. (Please see Tip #1308 on the importance of creating a restore point.) In dynaMACS you can control when your Restore Points are required or set a warning when the Restore Point SHOULD be done. The following tip will walk you through setting this up. From the main dynaMACS screen select Other Functions>Administration>System Information Setup. Select the Restore Points tab at the top of the System Information Setup screen. There are three processes for which you can setup warnings or required defaults. Select the appropriate radio button. Required Everytime will force the user to create a restore point each time this process is run. Required Once Daily will force the user to create a restore point the first time this process is run each day. Warning Everytime will display a warning to create a restore point each time this process is run. Warning Once Daily will display a warning to create a restore point the first time this process is run each day. Never will not show a warning or force a restore point when this process is run. 5. Once your selections have been made click on the Save button. dynaMACS Sales IQ has a unique feature that can map the customers you want to visit with Google Maps. The example below will show you how to filter the criteria and customize which customers you visit. First we will focus on the geographic area in the state of Illinois where the sales manager from Lee Jacob wants to visit. 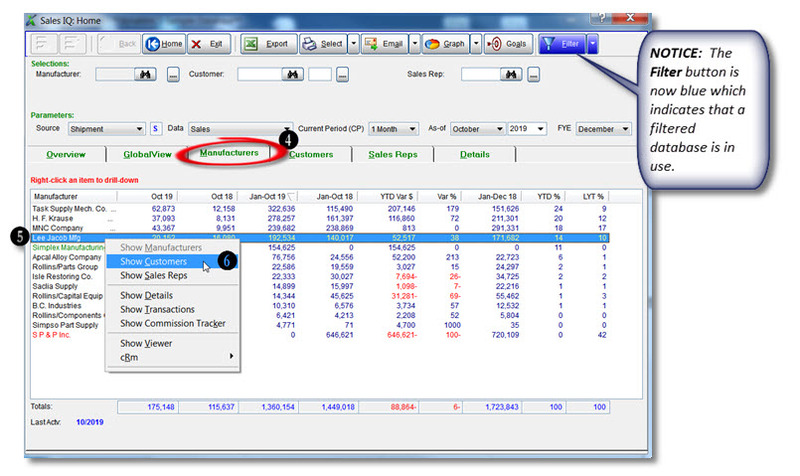 From the Sales IQ screen, select the Filter button. In the Customer State/Region field enter “IL” and “IL” (from and through) and select “Include This Range”. 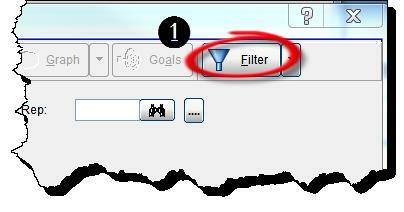 Select the Apply button to create a filtered database. You will be back at the Sales IQ screen. Select the Manufacturers tab. Highlight and right click on the manufacturer. In this example it is Lee Jacob Mfg. 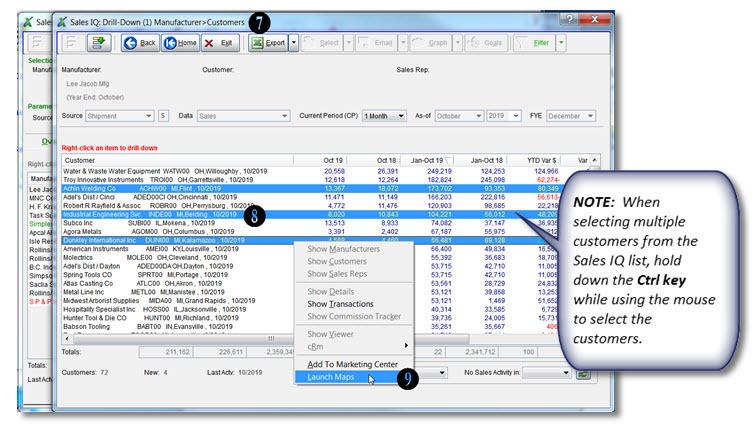 Select Show Customers from the drop down menu. 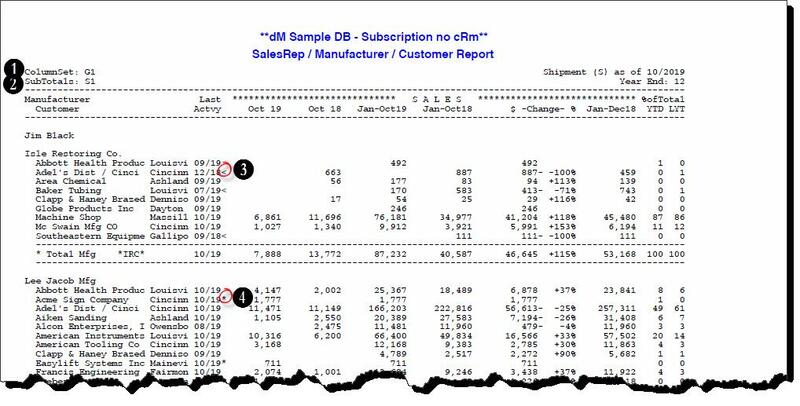 A new Sales IQ Drill Down window will open displaying all of the customers that buy from this manufacturer Lee Jacob in Illinois in descending sequence of year to date sales. Highlight the customers that you wish to map. Right click and select Launch Maps from the drop down menu. The selected customer locations will now appear in Google Maps. Within Google Maps you are able to select which locations to visit and you can also re-sequence the route if desire. When reviewing your dynaMACS Sales Analysis reports there are two symbols to look for that will easily identify customers with first time sales as well as customers with no sales in 3+ months. There are also codes that are displayed to help you identify Column Settings and Sub Totals that where selected for this report as well as filters that may have been used. 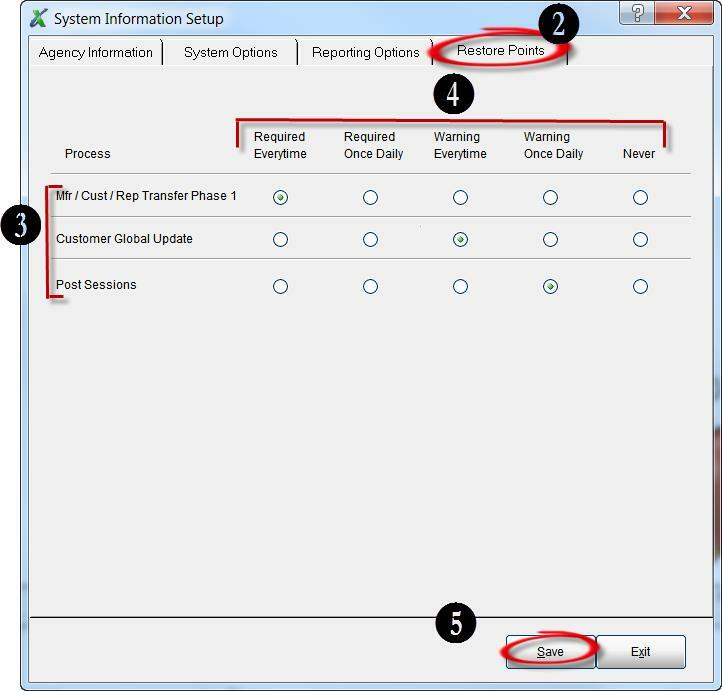 The Column Set displays the Column Set that was chosen when creating the report. In the following example G1 was selected. The Subtotals displays the Subtotals Code that was selected when creating this report. In the following example S1 was selected. Customers that have a Less-Than (<) sign to the right of the Last Activity date are those that have no sales in 3 months or longer. Customers that have an Asterisk (*) to the right of the Last Activity date are first time buyers. 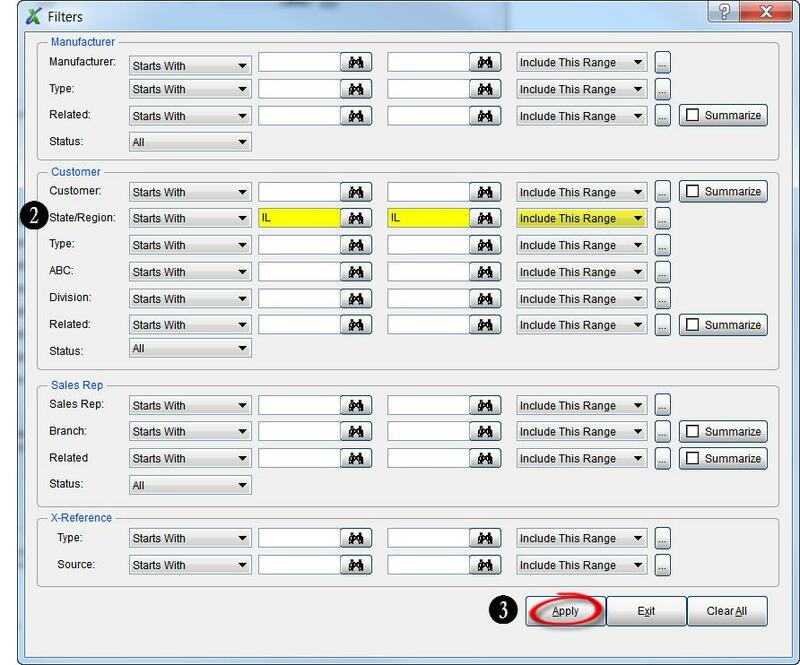 The Filter field at the bottom left hand corner of the report will display all of the filter selections chosen when creating this report. In this example we have selected Mfg Code IRC thru MNC, Rep Code is JB and Cust Type A thru Z. Using dynaMACS to analyze agency performance based on quarterly numbers. http://www.dynamacs.com/wp-content/uploads/EmpoweringdynaMACS_Logo-Vertical.png 0 0 dynaMACS Software http://www.dynamacs.com/wp-content/uploads/EmpoweringdynaMACS_Logo-Vertical.png dynaMACS Software2016-10-10 14:09:582016-10-10 14:09:58Using dynaMACS to analyze agency performance based on quarterly numbers. 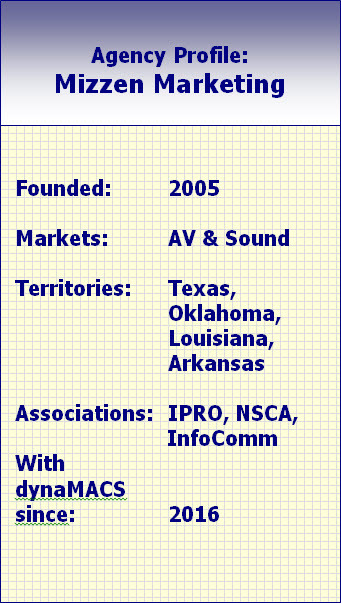 © MACS Software Contact: sales@dynamacs.com / (800) 321-1788 Powered by Dynamics Online, Inc.